EAST RUTHERFORD, N.J. (AP) — After shipping superstar wide receiver Odell Beckham Jr. to the Cleveland Browns in a stunning trade, the New York Giants made sure Eli Manning had his second-favorite target locked up for years to come. 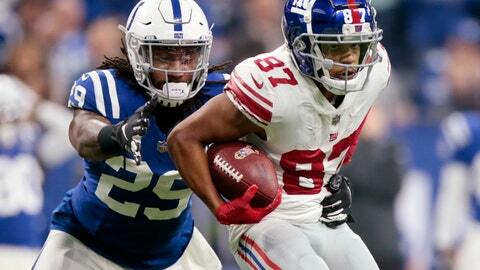 The Giants on Friday signed Sterling Shepard to a four-year contract extension that will pay him roughly $41 million. The signing comes a month after general manager Dave Gettleman stunned many by trading Beckham to the Browns for the No. 17 pick in this month’s draft, safety Jabrill Peppers and a third-round pick. A second-round draft pick in 2016, Shepard has 190 catches for 2,286 yards and 14 touchdowns in three seasons. He has been durable, missing five games in 2017. He finished third on the team with career-high totals of 66 catches for 872 yards and four touchdowns last season. The trade has made Shepard the focal point of a receiving group that added veteran Golden Tate in free agency and has a group of veteran role players. New York (5-11) may look to add a down-the-field receiver in the draft, since Shepard and Tate are primarily slot players. Shepard blossomed over the past two seasons as Beckham missed most of the ’17 season with a broken ankle and the final four games last season with a quad problem. How much the Giants rely on the receivers this season remains to be seen. The offense revolved around NFL Offensive Rookie of the Year Saquon Barkley last season, and his role will likely increase with Beckham gone.